"The Hearth-Fire Glows for You" at Morven ~ The History Girl! Set back from Stockton Street in Princeton is a small, but stately mansion with a horseshoe driveway lined with catalpa trees. Since the 1750s, this home, known as Morven, has welcomed Revolutionary War patriots, a signer of the Declaration of Independence, countless politicians and statesmen, industry leaders, and even a poet through its doors. Morven's significance as the home of the Stockton family, Robert Wood Johnson, and five New Jersey governors demonstrate its rich cultural importance and its impact on the development of New Jersey State history. The Stockton family settled in the Princeton area in 1701 on land that was granted to Richard Stockton's grandfather by William Penn. Richard Stockton built a home in the 1750s on his family's property. In 1757, Richard Stockton married Annis Boudinot. The small, wooden-framed home that Stockton built suffered a fire in 1758. Stockton quickly rebuilt, in stone and brick. Remains of the 1750s structure can be seen in the wall, as the remains of a large hearth and flue were discovered during renovations. Annis named the home "Morven" (meaning "big mountain" in Gaelic) after the mythical Gaelic castle of King Fingal in James Macpherson's Ossian Saga. Together at Morven they had six children. Richard Stockton was a graduate of the first class of The College of New Jersey, now Princeton University, in 1748. His father, John Stockton, was instrumental in its founding. Richard Stockton studied law with David Ogden, of Newark, who at that time was the head of the legal profession in the province of New Jersey. Stockton was admitted to the bar in 1754. In 1763, he received the degree of Sergeant at law, the highest degree of law at that time. In 1776, Stockton was elected to the Second Continental Congress, where he and four others from New Jersey signed the Declaration of Independence. During the Revolutionary War, in retaliation for being a patriot, the British under General Cornwallis plundered Morven, burned Richard Stockton's "splendid library and papers, and drove off his stock, much of which was blooded and highly valuable." 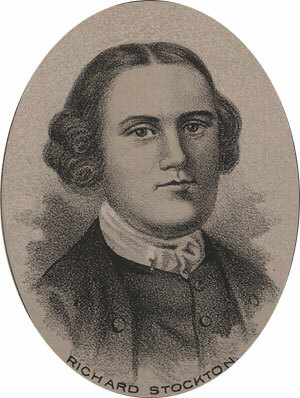 Stockton had been with fellow signer George Clymer in New York State on a two-month journey to assist the Continental Army. On his return to Princeton, he traveled thirty miles east to the home John Covenhoven, to evacuate his family to safety, and away from the path of the British army. While there, on November 30, 1776, he and Covenhoven were captured in the middle of the night, dragged from their beds by loyalists, stripped of their property, taken to Perth Amboy, and turned over to the British. The day Stockton was captured, General William Howe had written a Proclamation offering protection papers and a full and free pardon to those willing to remain in peaceable obedience to the King. George III. Although many took the pardon, Stockton never did. He was put in irons at Perth Amboy and brutally treated as a common criminal. He was moved to Provost Prison in New York where he was intentionally starved and subjected to freezing cold weather. After nearly five weeks of brutal treatment, Stockton was released on parole, his health ruined., in January of 1777. Stockton returned to Morven where he took no further part in the revolution. Richard Stockton died in 1781 at Morven and was buried at the Stony Brook Meeting House Burial Ground in Princeton. After Stockton's death, his wife Annis remained at Morven, often playing host to George and Martha Washington throughout the 1780s and 1790s, in addition to maintaining regular correspondence with them. It was through her letters with George Washington that she received the nickname "the elegant Muse of Morven." Annis was also poet, writing over 125 poems. She was one of the first published female poets in America and was an early advocate for women's rights. In addition to her writing, she was also a patriot. Prior to the British invasion of Princeton, she hid important papers of the American Whig Society of The College of New Jersey. She said, "Tho a female, I was born a patriot." She was later recognized by the Whig Society for her work. Richard Stockton, known as "The Duke," was born in 1764 and inherited the family estate after his marriage. During his tenure, Morven underwent renovations and improvements. For his mother, Annis, he built a private morning room located off of the main parlor, in order to keep her separate from his wife, whom she has a strong dislike for. He graduated from Princeton in 1779, and studied law in Newark with his uncle, Honorable Elias Boudinot. At twenty-five years of age, he stood at the head of the New Jersey Bar, and maintained that position for forty years. In 1796, he was elected to the United State Senate and filled the unexpired term of Fred Frelinghuysen, serving until March 3, 1799. He also served one term in the House of Representatives, 1813-1815. During the Duke's ownership, Morven officially received Marquis de Lafayette in 1824 during a visit to Princeton. Richard Stocked died at Morven March 7, 1828, and his wife passed away December 25, 1837 at Morven. View of Morven from the rear of the property, circa 1850. After "The Duke's" passing, his eldest surviving son, Commodore Robert Field Stockton, inherited Morven in 1828 at the age of thirty-three. Robert Field Stockton became a Commodore in the United States Navy, and was elected U.S. Senator from New Jersey. Between 1842 and 1844, the Commodore designed and built the U.S. Steam Frigate "Princeton." On February 28, 1844, the boat was taken out for an excursion down the Potomac with President Tyler, members of the President's Cabinet and Congress, and other distinguished guests. During a demonstration of its gun the "Peacemaker," it exploded, killing the Secretary of State, the Secretary of the Navy, and several members of the crew. A large number of civilians and crew were injured, including Commodore Stockton. On May 28, 1850, he resigned from the Navy, in order to attend to his private interests and served as president of the Delaware and Raritan Canal Company until his death. Commodore Stockton improved and embellished Morven. He was excessive in the use of money to carry out his purposes, whether public or private. Among his purchases was a large piano and paintings of a number of family members by artist Thomas Sully, all on display today in the home. He died at Morven on October 7, 1866. After his death, his son Richard Stockton inherited Morven. The deceased Commodore had no money left to leave to his sons,(having gone through two large fortunes in his lifetime), so Richard could not afford to maintain his father's home. Richard sold the horses, livestock, and other items of the estate. He then sold Morven to his cousin, Major Samuel Witham Stockton. Samuel Witham Stockton, served in the Civil War as a lieutenant in the U.S. Cavalry. Helen Hamilton Shields married Bayard Stockton, a grandson of the Commodore, in 1894, and resided at Morven into the 1920s. Bayard Stockton bought back Morven from his third cousin, Samuel Witham Stockton, in 1891. Aware of Morven's rich history and family connections, Helen was the first to promote its importance through lectures, books, and magazines. In the 1920s, she restored the property in the spirit of the Colonial Revival movement. Inside the home, parquet floors were installed and missing or deteriorated historic moldings and features were recreated. Her most visible enhancements to the property was the recreation of the gardens to what she believed Annis and Richard's garden may have looked like. The garden was included in the Garden Club of America's 1930 publication Gardens of Colony and State. The gardens at Morven have once again been restored to their former glory in the Colonial Revival style. In 1928, Morven was leased by the Stockton family to General Robert Wood Johnson, Chairman of Johnson & Johnson and the first non-family member to live at the property with his wife Maggi, and their daughter Shelia. While at Morven, Johnson added a pool, pool house, and tennis court at the rear of the property. The pool house was restored in 2011 to reflect the year 1941 when it was built. Johnson and his family left the property in 1944. 1941 Pool House at Morven. In 1945, Governor Walter Edge purchased Morven from the Stockton family with the provision that it would eventually be transferred to the State of New Jersey for use as a governor's mansion or museum at the end of his term. Between 1944 and 1982, five New Jersey governors resided at Morven. In 1959, Cuban Prime Minister Fidel Castro visited the Governor's Mansion in Princeton during Governor Robert Meyner's second term. Cas­tro was invited to speak to a small group of under­grad­u­ate stu­dents and fac­ulty mem­bers of the Woodrow Wil­son School. When Richard J. Hughes was governor, President John F. Kennedy visited Morven in 1962 during a campaign swing through Princeton. Other notable guests have included Princess Grace, Ethel Kennedy, and Jimmy Carter. In 1982, the Governor’s Mansion was relocated to Drumthwacket. Upholding Governor Edge's wishes, Morven underwent an extensive restoration and archaeological investigation in order to transform the structure from a residence to a museum site. Morven reopened as a museum and garden in 2004. Today, the first floor of Morven has been set up with interpretive panels relating the history of the home and its occupants, in addition to period furnishings and art. The second floor of this stately mansion hosts numerous changing exhibits throughout the year. Today, walking through the halls of Morven, one may reflect upon the numerous individuals who have now become part of our nation's collective history that have resided in or visited this location in the center of historic Princeton. Carved in the library fireplace mantle is the Latin phrase, "Tibi Splendet Focus," which means "The Hearth-Fire Glows for You," a reminder that all are welcome to Morven, just as they have been for the past 250 years.